Olio is one of those words dearly loved by crossword puzzle makers but that you never hear in real life. Olio means a miscellaneous collection of things, and that’s what today’s blog is — a collection of loosely connected thoughts. Every time I write a blog using speech recognition software, I am especially pleased with how easy it is to tag an article. Normally, I would scour a blog searching for keywords, then copy and paste those words into the blog editor. This always added an extra 15 minutes or more to a blog — not that I begrudged the time, but it felt laborious. Now all I have to do is set my cursor at the bottom of the document, re-read what I wrote, and voice any terms I come across that I wish to use for keywords. Then I copy and paste the entire list into the blog editor. I don’t honestly know if using speech recognition software to tag an article saves time, but the process is so much less tedious, I don’t mind tagging as much as I did. People keep telling me that one day I will understand the good that has come from destroying my arm, but I don’t necessarily think things — especially this injury thing — happen for a reason. They just happen. I do know most of us tend to make the best of bad situations, because really, what else can we do? In my case, since my pulverized wrist keeps me from two-handed typing, I got speech recognition software to make writing easier. And oh, it truly does make writing easier — though is it still writing if one is actually speaking and not writing? I imagine writing has come to mean any means of disseminating one’s thoughts via words to people not immediately present. Every writer knows there is a vast difference between typing and writing, so there is also a difference between merely talking and writing using speech recognition software. Still, as helpful as the program is, there is no way I would have ever exchanged a perfect arm for a piece of software, especially since I could have bought it either way, giving me both a perfect arm and speech recognition software. As for other benefits of having broken my arm? There are none that I can see. I can’t think of any lesson I learned. No monetary windfall came my way, and because of all the bills, I’m worse financially than I was before. And, of course I am worse off physically. The best I can hope for is to regain as much mobility I can, learn to live with whatever disability (and pain) is left, and not let fear of injury impede further adventures. Oddly, with all of the care and worry of the external fixator, and the recent surgery to remove it, I’d forgotten I broke my elbow in so many places that I now have a metal elbow to match the various pins in my arm and the plate in my wrist. I never did any physical therapy for the elbow, just exercised it, and though I don’t yet have full mobility, I’m doing quite well. And my fingers are working to a certain extent. I was finally able to cut my hair (yep, I’m a do-it-yourselfer all the way). And today I discovered I could tie my shoes. Such a big girl now! Can tie my own shoes! When I had the occupational therapist, she tied my shoes for me; I left the laces tied and used the shoes as slip ons. During the past four and half months, ever since I fell, I’ve been more or less drugged. It didn’t really feel as if I were, but now that I have been drug-free for a week — the recent anesthesia has worn off and I’ve sworn off pain pills — I can see that I’ve been in some sort of altered state. I don’t remember everything that happened during the past few months. It’s as if I walked out of the theater after the dance performance on November 19 and woke up today living in a different room, different neighborhood, and with a disabled arm. I’m also disoriented as to time. I fell in the autumn and now summer is on the way. I seem to have misplaced a season or two. And I’m disoriented as to days and hours. When I was out walking today, I panicked, thinking I should be at the doctor’s office for my post-op appointment. I called to tell them I would be late and discovered I would not be late but in fact was twenty-three and a half hours early. I don’t really know what to make of all this, though I suppose there is nothing to make of it. Just continue on as I’ve been doing — one day at a time, taking the bad with the good. My most recent watercolor. Maybe it’s time I start signing them. Yes, sign your work. I was told this year’s ago by an artist of some repute and talent, always sign your work. Pain, injury and drugs will rob you of the details, the bad and the good as well as the indifferent. I’m so heartened to hear you’re doing so much better, even if that’s a relative term. Hope thus trend continues. Also, just wanted to say I really love your latest painting. It’s so cheery and bright. So good to hear from you! I hope your new place is working out for you. 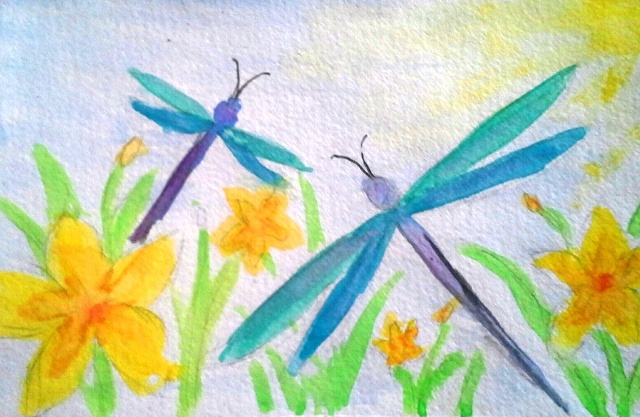 I like your water color of the dragon flies! Olio sounds like a word Stephen King would use just to get people to look it up in the dictionary (he made me look up soupcon after he used it in Gerald’s Game. I always thought that word was spelled soussant or soussaint and just pronounced “soo-san”). This is the first time I ever used olio. It seemed appropriate. I love your recent watercolor!! Maybe they can illustrate a book someday! I am glad to see that you are recovering. It is a terrible slow process, isn’t it? I don’t think everything happens for a reason. Sometimes things just happen! Sign it – it is so lovely and cheerful. So glad you are getiing better. Your blog has truly been a lifeline for me during my time of early grief. It is getting closer to two years now and still the monster has me in its grip. When you least expect it a surge of grief nesrky floors you. And it keeps surprising me how vulnerable I still am. Sometimes I think I lead a life of quiet desperation – lonely amongst people always lying when they ask me how I am because I know how much they want me to recover. This is one if the few places where I can be totally honest about my feelings and you have my gratitude for giving us this space. All the best for you. It’s hard. You have to have at least one person you can be honest with and admit the hardship, so I’m glad yo found me. As you say, those grief upsurges always come when you least expect it. People think we should be able to control our emotions, but grief is more like a storm (or a monster!) than an emotion — it comes when it comes and all you can do is wait it out. Wishing you peace as you near your second anniversary. Does the arm feel strange–lighter, perhaps–with that heavy equipment removed? I thought it would — I feared waking up from the anesthetic, thinking that in the disorientation, it would seem as if the arm had been amputated, bu apparently the pain (and the soft cast) was heavy enough that I didn’t notice a lot of difference. I am guided by the phrase “God does not make everything happen for a reason but with God’s help I can find reason in everything that happens” I can choose to find no reason or many….all,none or anything in between carries the same weight….opening to possibilities is NOT a competition to be better than the next guy nor is it a celebration of living through a horrible experience. On another note, have you ever considered combining your beautiful art work with your insightful writing and making a line of sympathy cards? What an interesting possibility — making a line of sympathy cards! I have no idea how to even begin, but I will keep the idea in mind. Great idea. Beautiful watercolors. Be sure to sign and date them. I really like the word olio. The sound of it reminds me of my mother mixing the color packet into oleomargarine right after WWII, making something out of mixing things together. The two words seem similar. And I LOVE this current painting. In fact, I really think Terry’s idea of combining your artwork with your insightful words to make sympathy cards is a terrific idea!!!! I think you’re right about not remembering being a way of helping me heal. It’s good not to be burdened by past pain. Sympathy cards sound interesting. Have no idea how to even begin, though. Or how to sell/distribute them. I have zero marketing skills. But definitely something to think about. Pat, if you can figure out how blogging works and all that you know about the Internet, marketing should be a breeze for you. You really are VERY smart! I would suggest writing down some short sentences involving some type of grief and then try painting what comes to you while thinking of the sentence. When you have collected several, you might contact a professional in marketing and see what they say. This seems to me to be an excellent path for you! Where there is a will, there is a way! Go for it! I like your idea of painting using grief-related sentences as inspiration. I’ll see what happens. Oh goodie!!!! I’m sooooo excited. I really think this could be great for you!!! And doing this could be a healing experience not only for others, but also for you, plus there’s the potential to make some money and, thus, secure your future!!! Can’t hurt to try!!!! !